By contrast, in another recent article on political evolution based on more traditional materials, Abrutyn and Lawrence (gated) argue that gradual quantitative change in sociocultural evolution can reach thresholds where qualitative punctuated change ensues. “Punctuated equilibrium . . . has more empirical support than gradualism in explaining state formation.” In Mesopotamia and Egypt for example states emerged where chiefdoms did not exist. Obviously we have not yet heard the last word on political evolution. 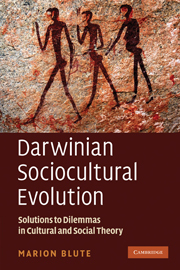 Tagged with Jared Diamond, political evolution, Seth Abrutyn and Kirk Lawrence, sociocultural evolution, Thomas E. Currie et. al. Browsing on the shelves of my university library in an evolution section the other day, I came across Cameron M. Smith and Charles Sullivan’s “The Top 10 Myths about Evolution” published by Prometheus Books in 2007. If I had even googled “evolutionary myths” I would have found it before I wrote my blog posts on the topic! And when I did google it, I found that Michael Le Page had also published “24 myths and misconceptions” about evolution in April 2008 in the new scientist. Since Le Page only lists his without discussing them, I will stick to Smith and Sullivan here. After having belatedly discovered their book, I was curious about what similarities or differences there would be in our takes on these (beyond the fact that they wrote a book chapter about each while I wrote only a paragraph). They have ten myths and I had twelve. Theirs are a little more popularly-oriented and mine a little more technically-oriented. For example, several of theirs pertain to evolution-creation controversies which do not interest me very much (their #2 evolution is “just a theory”, #8 creationism disproves evolution, and #9 intelligent design is science). Similarly, several of theirs are specifically about human evolution (#4 “the missing link” and #6 “people come from monkeys”) which I ignored. On the other hand, I got into some phenomena (#1 modes of heredity and drift, #4 stability and change, #7 the nature of species, and #9 adaptive phenotypic plasticity) as well as some modern issues such as #6, the relationship between the genetical theory of evolution and development and ecology, which they mostly do not. We both had some similar myths but used them, at least in part, to make different points. We both had a “randomness” myth (their #5 that “evolution is random” and my #2 that “mutations are random”). They ultimately conclude that mutations are random but selection is not. I thought it important to clarify that the only sense in which mutations are random is Donald Campbell’s sense of blind or non-prescient. We both had a “survival of the fittest” myth – (their #1 and my #5). They use theirs to make the point that all competition is not violent (a point they make again in their #10 that “evolution is immoral” and that I made in my #10 that nature is “red in tooth and claw”). Ultimately however, their #1 and my #5 make the same point, that reproduction matters too and that defining fitness is a complicated matter. We both had a “progress” myth (their #3, my #12). I claimed the concept is scientifically meaningless. They used it in part to discuss the issue of increased complexity which I discussed in my #11 and we agree that there is no necessary tendency for complexity to increase in evolution, albeit it has in some lineages. We both had a myth that is really ecological rather than evolutionary, but different ones. Theirs was #7, the myth of “nature’s perfect balance”, mine was #8 that “resource depletion and environmental degradation go hand in hand in nature”. There remain a very few significant disagreements. I think they are incorrect in denying that acquired characters can ever be inherited (p. 30), in fact I included that as myth #3, and in claiming that evolution is always gradual (p. 68). However, I found this a very useful book and I recommend it.